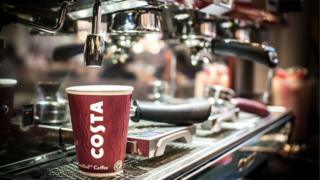 Whitbread is to split off Costa, the UK's biggest coffee chain, as a separate firm, after activist pressure. The demerger will be "pursued as fast as practical and appropriate" to optimise value for shareholders. The activist investors, Elliott Advisors and Sachem Head, together control about 10% of shares. Costa has more than 2,400 UK coffee shops, as well as some 1,400 outlets in 31 overseas markets. Costa Express has 8,237 vending machines worldwide. The spun-off firm will be floated and listed as a separate business by 2020. Shares in Whitbread closed down 0.2% at £41.77, valuing the company at £7.75bn. Whitbread said Costa Coffee was the clear UK market leader and second-largest chain globally, with attractive long-term international opportunities. However, for now Whitbread will remain the owner and operator of Premier Inn, which has also been in the spotlight as another possible asset ripe for spinning off. Chief executive Alison Brittain said: "We are confident that both Premier Inn and Costa will soon be businesses of sufficient strength, scale and capability to enable them to thrive as independent companies. "The board, therefore, believes that it is in the best long-term interests of Whitbread's many stakeholders to separate Premier Inn and Costa, via a demerger of Costa. "The management team and I are excited that the strategy we are executing will give us the opportunity to create two high-quality independent businesses that will create long-term value for our stakeholders." Ms Brittain told BBC Radio 4's Today programme the sale was taking place because the time was right, not because of activist shareholder pressure. She said Whitbread had been building up the international strength of both Premier Inn - by adding a German hotel chain - and Costa, by buying out one of its Chinese joint venture partners. Ms Brittain said Costa hoped to triple its presence in China, where it is second to Starbucks: "It's been ... important to make sure that we had an international growth story for both businesses before they separate." Whitbread also reported annual sales growth of 6.1% to £3.3bn, while pre-tax profits rose 6.4% to £548m. The FTSE 100 firm also owns Beefeater and Brewers Fayre among other brands. Over the years, it has owned well-known brands such as TGI Fridays, Pizza Hut and Marriott Hotels. The firm acquired Costa in 1995 from founders Sergio and Bruno Costa. Mark Brumby, chief executive at financial advisors Langton Capital, said: "This [demerger] may take two years and, in the meantime, growth will be slower than it has been recently. "Cautious comments regarding trading and the confirmation of what had been widely expected may combine to lead to a little profit-taking." Plastic recycling: Why are 99.75% of coffee cups not recycled?